"Kandui Villas stands alone as the most refined and comfortable resort ever built in the region & with 20+ world class waves close by, you're well positioned to score the waves of your life." "Overlooking Kandui Left, guests staying at the resort will have unrivalled access to one of Indonesia's crown jewels as well as being a 5 minute boat ride from Rifles." Located in the Mentawai Islands in the heart of the Playgrounds surf zone, Kandui Villas stands alone as the most refined and comfortable resort ever built in the region & is arguably the world’s premier luxury surf resort. The resort has taken the Mentawai experience to a whole new level with the extravagance of the highest levels despite being tucked away from western civilization. The amenities are second to none and include an infinity pool, gym, spa, spacious luxury accommodation, gourmet food as well as unrivalled service and facilities. With 20+ world class waves within a short speedboat ride from the resort, including the world renowned Kandui Left (and baby Kandui) right on your doorstep, you’re well positioned to score the waves of your life. Ideal for intermediate and advanced surfers, the resort is particularly good for groups, families or couples looking for the ultimate luxury surf trip. Kandui Villas can accommodate more than 30 guests within its 9 luxury “umas” and 1 “triple” uma. Each includes air conditioning and has two king-sized beds downstairs, and one king sized bed (or two single sized beds) – upstairs, in a second-story loft. Kandui Villas is a compound of nine luxury uma’s – what the Fijians call bure – and one triple uma – which is three regular-sized luxury umas connected together, for a total of 12 umas. Each one is quite large at 7.5 meter wide x 10.5 meters long and contains two king-size beds downstairs, and one king size or two single size beds in a spacious, second-story loft. The Kandui Villas impressive restaurant stands two stories high & is located directly next to the swimming pool. Guests will benefit from gourmet fresh food during their stay with a wide variety of healthy meal options always available. Guests can start their day with a “made to order” breakfast before or after their morning surf. Daily cuisine is plentiful and varied and includes local & freshly caught seafood as well as Italian, Japanese, Mexican, Thai, Chinese, American, and of course Indonesian. The resort is also proud to serve in-house organically-grown fruit & vegetables each day. The Bar and Palapa building is located next to the Games Room and directly overlooks the swimming pool. The area serves as the real heart of the resort. Overlooking the infinity pool – it really is the perfect place to have a drink, share stories of the days surf sessions, or do absolutely nothing. Guests can enjoy their favourite cold beer, spirits, mixed drinks, as well as wine, and even champagne. The open plan layout comes complete with large flat screen satellite TV, big couches and chill out areas, cool tunes and a separate bar snack & drinks menu. There’s also a ping pong table & pool table across in the games room. - Private gym includes two tread mills, an exercise bike, free weights, a multi-exercise machine, a multi-exercise cable machine, and exercise bike, pull up bar, jump ropes, an inversion table, exercise balls, and yoga mats. Kandui Villas offers a team of 3 professional photographers offering their photography services, to capture high resolution photo’s of surfing, from land, water, boat, and sky. 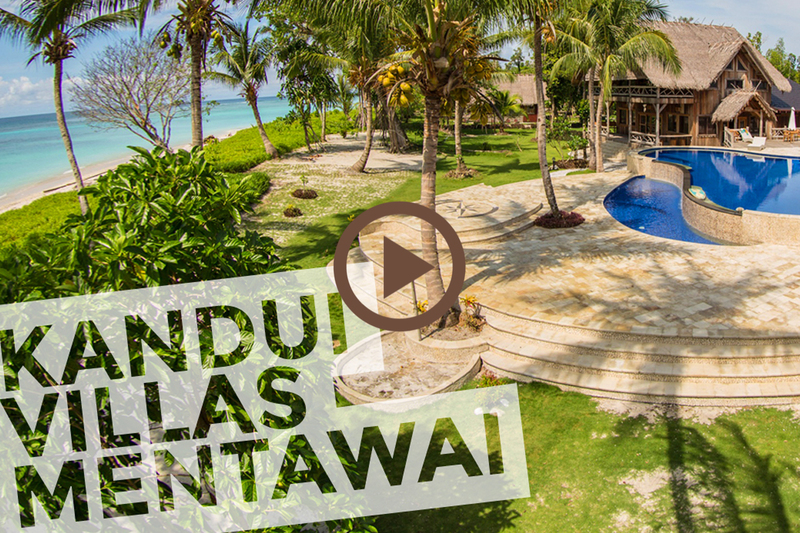 Kandui Villas also offers professional HD personalised video services, to film and document your surfing & lifestyle throughout your stay. The resort offers traditional Indonesian therapeutic massage to relax and sooth away sore muscles from travel, surf and everyday stress. The massage oil used is homemade raw coconut oil, that's shredded and pressed lovingly by their very own Indonesian staff. Kandui Villas has an impressive inventory of boats for accessing the 20+ waves. These include two, five-meter plastic dinghies, one 5.2 meter Kahajaya center-consul speed boat and four, 45-50 foot longboats for accessing the all the breaks that are not located around Kandui Island and are used for the ALL Access packages. Each boats is launched from one of four cement docks. Three of the docks are built in a mangrove lagoon located behind each section of the resort making for easy transitions to and from the resort. The fourth dock is a jetty located on the front beach side of the resort, in a keyhole channel between Kandui Left and Baby Kandui. Guests of the resort will have 15 high performance resin 8 surf boards at their disposal. Avoid the hassle of dragging your prized possessions half way around the world, guests can also dodge the inherent surfboard handling costs that can soon mount up over multiple flights. The Resin 8 boards are duplicates of master shapes by Wade Tokoro, and Sam Egan with sizes 5’11” 6’0″, 6’1″, 6’4″, 6’5″, 6’6″, 6’7″ 6’8″, 6’11”, up to 7’2″. Resin 8 surf boards are arguably the best epoxy surf boards ever made, are high performance, and durable, so they are the perfect boards for nearly everyone. Guests also have access to 7 Stand Up Paddles Boards & 2 Kayaks that can be used free of charge. The SUP’s are 10′, 10’2″, 11’6″, and 3 x 12 foot cruiser boards perfectly suited for paddling around the waters of our tropical paradise. Its also one of the least crowded times to visit the region. Expect to surf head high Burgerworld which needs a small swell to break properly, or head high Nipussi which is another wave magnet, and even Bank Vaults. The waves around Kandui Island are likely to be on the small side. A very small south swell & you'll be surfing alone at A-Frames, 4 Bobs & Pistols. Wind conditions are generally very light & variable with calm & sunny weather. Similar to January and February but with a little more consistency with some bigger days thrown in the mix. Still uncrowded. Regarded as the start of the season, expect head high surf all the way up to triple over head although largely very user friendly conditions. Expect light northerly winds in the morning followed by variable winds after midday. Crowds are typically pretty light but increase throughout the month. This month often produces the biggest "south" swells of the year with the cleanest conditions for waves like Rifles, its a month that attracts good surfers looking for big barrels hoping to score Rifles on a really good day. Similar to May but with a slight shift to more south easterly winds. But still generally light & variable. Bigger in size still, with very consistent swell, its rarely less than head high. Thunderstorms are more prevalent which combined with the abundance of swell means that many breaks can "turn on" with a passing storm. Winds tend be variable & it is a month where guests really count on having excellent surf guides to out smart the other camps and visiting charter boats! More thunderstorm activity, similar to July, although there are still beautiful sunny days. Storms come and go. The swell cycle continues and the surf is still rarely less than head high. The crowds are thinning out a little compared to May to August. October can still be a great month but certainly can have more patchy periods of smaller surf. Visiting guests tend to prefer smaller conditions around the head high mark with the odd bigger day. Crowds usually thin out throughout the month and into November. At anytime from November until February there are windows of truly amazing surf and weather, but the once endless cycle of swell takes a well earned rest. Surfers that visit during this time can still expect really fun surf, in the shoulder to head high range. Many of the surf camps in the area close. Crowds are minimal. The above map gives you some perspective of the waves surrounding Kandui Island. Guests have the choice of choosing to surf the waves surrounding "Kandui Island" or an "All Access" package that gives access to all the regions waves. "All Access" Packages include surf transfers by long boat to all of the other waves located on the neighboring islands as well as Kandui Island (aka karangmajat island). Mentawai Fast Ferry - "Direct Transfers"
The resort has adopted a 10 day/10 night or 11 day/11 night schedule with "set travel days" (check "booking & pricing" tab for dates & availability). At the end of your trip, guests will arrive back into Padang around 4:30pm. Please do not book any outbound flights before 7:00pm. - FREE for children 3 and under. * If you are visiting Kandui Villas during our Shoulder Season (October – March), the Mentawai Fast dates & times may vary. Please contact us prior to booking your airfare. Mercure Hotel - www.mercurepadang.com or Oxville Hotel - http://oxvillehotel.com (both are in the hotel district, about a 5 or 10 minute taxi ride to the ferry port). Please note it is also possible to travel on different dates using a combination of the mentawai fast ferry to Siberut and longboat to Kandui Villas. Please contact us for more details and pricing. Padang Airport to Kandui Villas - "Direct Transfers"
A 50% deposit per person is required to secure your booking. Balance of payment is due 90 days prior to departure and is 100% non-refundable. A USD$50 processing fee is to be included for each transfer. By way of payment guests are agreeing to both Kandui Villas & Surf Camp Sumatra's Terms & Conditions. ‍Superb in every way. From the moment we arrived into Padang to the moment we flew out â€“ it was hands down the most memorable trip ever. ‍Jordan was exceptional in arranging the whole trip. We just had to sit back relax and enjoy the ride. Mind blowing resort in the most incredible surf region is a pretty good recipe for a very memorable surf vacation. Weâ€™ll be back for sure!